Hans and Linda Kohler of Osoyoos are donating almost $78,000 to the SOS Medical Foundation to help acquire medical equipment for the Penticton Regional Hospital expansion. Hans and Linda Kohler know the history of the South Okanagan about as well as anyone. Both born and raised in the South Okanagan-Similkameen, the Kohlers are long-time Osoyoos residents. Also long-time donors to Penticton Regional Hospital, they are donating almost $78,000 to help provide medical equipment for the current PRH expansion. Hans was born in Osoyoos in 1932 at the family farm about five kilometres north of town. His father had emigrated from Switzerland in 1929 when he was 20 years old and his mother was originally from Germany. Eventually Hans’ father moved to the Okanagan, settling in Osoyoos. In those days, the area was truly rural. 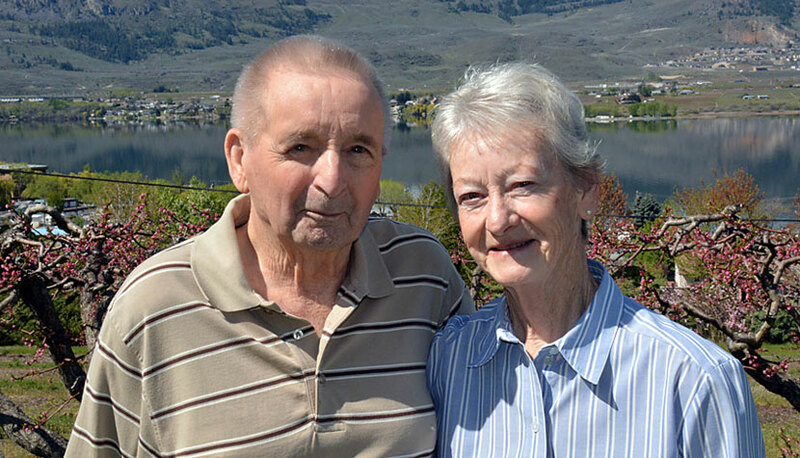 “When Hans went to school in Osoyoos, there was a lot of sagebrush in town,” Linda noted. When he was a teenager, the family acquired an acreage in the South Similkameen near Mount Chopaka. Hans met Linda while loading a truckload of hay in the late 1960s. At the time Hans was living with his four teenaged children from a previous marriage, but Linda soon became an integral part of the family. They now have six grandchildren and five great-grandchildren. Hans served as a director of the former Keremeos Growers Fruit Co-op for several years. Hans and Linda sold their Similkameen farm in 1980 and purchased his parents’ two-acre property overlooking the east side of Osoyoos Lake. They now lease out their peach orchard to a local grower. Avid travellers, the Kohlers have visited more than 60 different countries over the years, but are always happy to return home to Osoyoos. The couple take a lot of pride in donating to the South Okanagan Similkameen Medical Foundation’s $20-million campaign to provide the medical equipment for the $312-million Penticton Regional Hospital expansion. They first started donating to PRH in the early 1990s and haven’t stopped. Linda noted several family members have received treatment at PRH and they recognize the regional scope of the hospital. Hans recalled spending time in the former Penticton hospital being treated for sunstroke when he was a boy in 1942. Construction of the six-storey patient care tower at PRH is well underway and will be ready for patients in April 2019. Work will then begin on Phase 2 – including a major upgrade of the hospital’s Emergency Department.